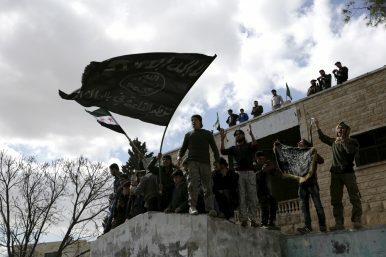 Protesters carry al-Qaeda flags during an anti-government protest in Idlib province, Syria (March 11, 2016). The new Code of Conduct from AQIS is an attempt to wrest back leadership from Islamic State. Al-Qaeda in the Indian Subcontinent (AQIS), the South Asian chapter of al-Qaeda, recently released a 20-page document which lays down a new code of conduct for jihadists all over the world to follow. The code of conduct is not only meant for members of al-Qaeda but also addresses jihadists operating across organizations and regional theaters, who are either allied with al-Qaeda or operate separately. The document continues to be scrutinized by analysts and experts in an attempt to draw a bigger picture about the intent and ramifications of this new code of conduct. The majority of the analysts have described the document either as a reiteration of al-Qaeda’s allegiance to Taliban, supplemented with a list of dos and don’ts for the jihadists, or a renewed thrust by AQIS aimed at expanding its footprints in South Asia, a region which is home to nearly 530 million Muslims. However, a close study conveys an intent far beyond what is manifest. The timing and the contents of the release convey a more nuanced message with wider ramifications and far-reaching consequences. The core message is essentially aimed at regaining the leadership of global jihad which al-Qaeda had effectively lost to Islamic State (ISIS ) since latter’s dramatic advance in Syria and Iraq in 2014. The release of al-Qaeda’s future vision through AQIS also suggests a finer point: that AQIS is perhaps the only regional affiliate over which al-Qaeda central exercises direct control. The geographically coterminous location of both al-Qaeda central and AQIS also adds to this phenomenon. The AQIS document should thus be seen more as a message from al-Qaeda central. The release of the latest document at a time when ISIS has effectively been wiped out of Iraq needs to be understood as a significant strategic maneuver by al-Qaeda. The new code of conduct is essentially a reiteration of Zawahiri’s 2013 document, which initially laid down the rules for jihadists to follow when engaged in the jihadi battlefield. “We avoid targeting all non-fighters belonging to enemy… such as women and children,” the document says. The current reminder serves critical message to those who were “swayed” by the brutal savagery of ISIS and shifted their allegiance to them. It is a sort of wake-up call to jihadists who allegedly ignored Osama bin Laden’s advisories on the behavior of Muslim combatants in Jihad. However, the success of ISIS in 2014 and subsequent declaration of a caliphate by its leader, served as a rejection of norms and guidelines laid down by al-Qaeda, which till then had enjoyed the status of an undisputed guide to the jihadi outfits across the world. The success of ISIS at the cost of al-Qaeda seemed as a validation of the mindless savagery practiced by the Islamic State. Over the next two years ISIS was able to relegate al-Qaeda to non-entity while Islamic State enjoyed streams of foreign recruits, money, and of course young women. The discourse within the jihadi community signaled the eclipse of al-Qaeda. ISIS proved to be a tactical and ideological antithesis to groups like al-Qaeda. It upended almost all the rules and strategies that al-Qaeda practiced and promoted. Bin Laden wanted jihadists to target the “far enemy” (the United States and its Western allies), which he believed was the root cause of all evils. ISIS focused on the targeting the near enemy, the apostate domestic Muslim regimes that they called taghuut (manifestations of Satan). Al-Qaeda disapproved of Muslims killing Shiites and Sufis in Iraq and elsewhere, as it believed that such actions alienated Muslim minds from jihad. ISIS, on the other hand, brutally targeted Shiite congregations, religious places and other Sufi targets, which it believed were beyond the pale of deen (faith). The anti-Shiite agenda enabled ISIS to attract numerous recruits from the Sunni population of western Iraq, who had suffered ignominious torture at the hands of the Shiite regime and the ruling Shiite militia. A sizable number of these Sunnis and other Naqshbandiya groups were instrumental in defeating al-Qaeda in Iraq after the U.S. surge rode high on the Anbar Awakening and the Sons of Soil movement. These dejected groups later joined ISIS and transformed it into a force majeure. Moreover, the declaration of a caliphate by ISIS was also seen as direct repudiation of the Taliban Emirate, to which al-Qaeda has pledged fealty. The re-emphasis on allegiance to the emir of the Taliban, deemed as the commander of the faithful, at this juncture serves as a reminder that al-Qaeda believes in establishment of an Islamic Emirate of Afghanistan as a key step toward the resurrection of the Islamic caliphate. The Taliban Emirate, for al-Qaeda, continues to be the only legitimate authority that could stake a claim to be the Islamic caliphate. Zawahiri had previously criticized the very existence of ISIS by claiming that the selection process by which Baghdadi became caliph was not according to the Islamic tradition. Al-Qaeda seem to have made smart choices in the past few years. It made a concerted attempt to distance itself from the so called lone wolf attacks in Europe and United States, thus deflecting a direct onslaught on its members and assets. This enabled al-Qaeda to slowly rebuild its capacity and influence initially at the regional level. AQIS, which was launched in September 2014, was an important milestone in the process of rebuilding. Additionally, al-Qaeda and its affiliate made deliberate efforts to show their rejection of the savagery of ISIS. Al-Qaeda shunned Islamic State’s coercion and fear and focused on garnering support by reaching out to local leaders and at times to the broader community within the Islamic world. Al-Qaeda also allowed its affiliates to rebrand and transform themselves into groups focused mainly on regional political agendas. This was done to gain a much wider domestic support base. It also allowed al-Qaeda to exploit support from local populations who were more keen on seeking solutions to their domestic crises than working for the success of global jihad. The rebranding of al-Nusra into Jabhat Fateh al Sham (JFS), dedicated to fighting the Bashar al-Assad regime in Syria, was one such attempt to expand al-Qaeda’s outreach in the regional theaters. With ISIS being forced to roll back, JFS is poised to play a bigger role in Syria. Similarly, AQIS, which has relentlessly been trying to increase its footprints in India and Bangladesh, has upped the initiative with this latest document, which also serves as a call for the Muslims in India and Bangladesh to be a part of domestic jihad in Kashmir, Myanmar, and Bangladesh. The support from Kashmiri militant groups could be a shot in the arm for AQIS, which till now has been able to attract an abysmally low number of new members in India. Though ISIS announced its Khorasan chapter in January 2015, it has not been able to launch any major attack inside Afghanistan, where as AQIS just few days into its formation launched a daring attack on Pakistan Navy Frigate PNS Zulfiqar in Karachi on September 6,2014. Though the attack was foiled, the involvement of serving mid-level naval commanders in the plot was a reminder of al-Qaeda’s ability to penetrate the official machinery in Pakistan and Afghanistan. As further proof of AQIS’s reach, an attack on a Taliban training center in southern Afghanistan in October 2015 resulted in killing 200 militants. The training center, perhaps one of the biggest in Afghan jihad history, was being run by AQIS. A close alliance with Taliban, apart from being a tactical necessity, also serves a strategic purpose for al-Qaeda. It conveys al-Qaeda’s commitment to jihad against the West in general and the United States in particular. Al-Qaeda’s leadership appreciates that jihad against the United States continues attract a larger currency and generates more traction among Muslims worldwide than targeting so-called deviant regimes and groups. Moreover, within the realm of religious discourse, ISIS was seen as a group of mediocre religious scholars. Islamic State’s erroneous interpretations and application of the Salafi jihadi principles of al wala wa’l bara (loyalty toward the faithful and disavowing of others) and takfir (excommunication of apostates) against other Muslim groups and individuals was condemned even by radical jihadi ideologues like Abu Muhammad Al Maqdisi. Maqdisi was widely accepted as the ideological guide of Abu Musab al Zarqawi, the deceased leader of al-Qaeda in Iraq (effectively the precursor of ISIS in Iraq). The emphasis on a code of conduct and adding more tolerant rules — like abstaining from attacking non-combatant Buddhists, Christians, and Hindus — should be seen as an attempt by al-Qaeda to garner more support (or maybe attract less hostility) from a wider group of people. The hope is to brand al-Qaeda as less radical than ISIS, hence avoiding a Western onslaught on its members; this is already happening in Iraq. The emphasis on adherence to the code of conduct at a time when ISIS is on the fringes also drives across a deeper message which al-Qaeda intends to convey: the reasons for Islamic State’s defeat. Al-Qaeda wants jihadists across the Islamic world to realize that ISIS’s defeat is the result of ignoring jihadi guidelines set by al-Qaeda and its leader Osama bin Laden, who is touted as the “reviver of jihad” in the latest document. The fall of ISIS is being attributed to the growing alienation and disapproval of its methods by the Muslim masses across the world. Thus, the document stresses that “al-Qaeda forbids carrying out operations that are beyond the understanding of Muslim masses and repulses them from jihad.” With its regional affiliates in Syria, Yemen, and South Asia getting more traction than Islamic State’s regional provinces, al-Qaeda’s new code of conduct is a deliberate attempt to reestablish itself as a pivot of global jihad, a position it had lost to ISIS. Sajid Farid Shapoo is a highly decorated Indian counterterror expert and two star general with 18 years of progressively senior experience in sensitive and high-profile assignments. He is currently completing his Masters in International Affairs with Specialization in Middle East at Columbia University, New York.